The Little Mermaid, originally written by Hans Christian Anderson in 1837, is one of the most enduring stories in the fairy tale genre. While the original had a somewhat bittersweet ending, quite unlike Disney’s, the idea of merfolk living under the sea has captured the imaginations of many since it’s initial publication. As much a showpiece as a tasty dessert, this cake is sure to impress. 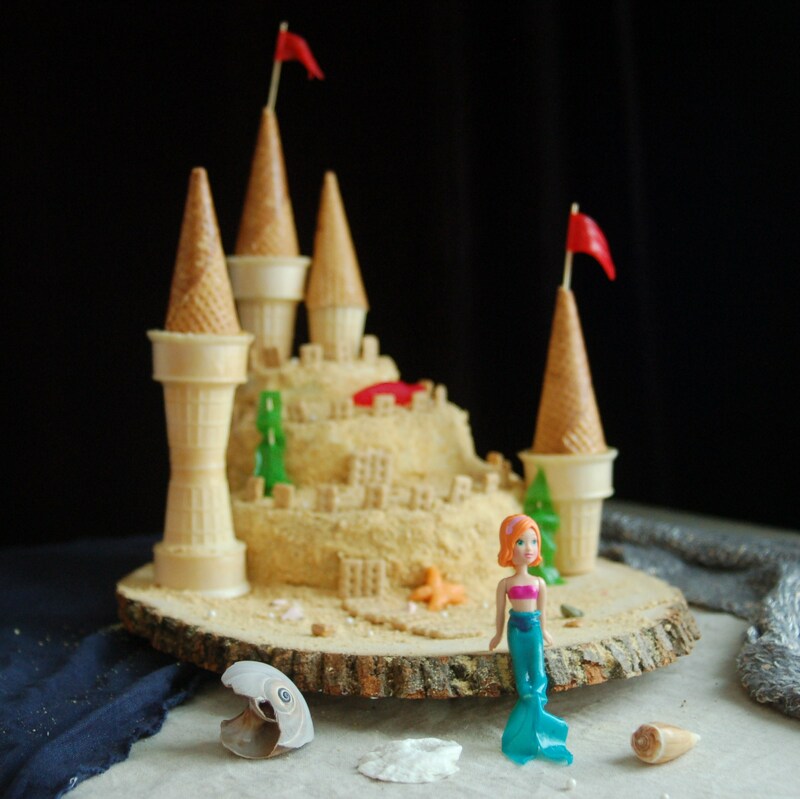 With this sandcastle cake, I try to pay homage to both the original and modern versions of the story, and make in edible form the amazing castles that merfolk might inhabit at the bottom of the sea. Assorted candies for decorations, such as Swedish Fish, Starburst, chocolate rocks, etc. Mix cakes according to the directions, then bake in a variety of round cake pans. The best combination is of three different sized round pans. After baking, allow the cakes to cool, then roughly frost the whole bottom tier. Lay the next one on top, frost, and top with the last. Don’t worry about getting crumbs in the frosting; they will be covered up with the graham cracker “sand”. While the frosting is still very fresh, gently press small amounts of graham cracker crumbs onto the cake until the whole is covered. Press the graham cracker sticks into the top of the cake to simulate crenellations, using a knife if necessary to make holes first. Add the ice cream cone towers, using wooden skewers to hold them in place, and icing to hold the roof cones on. Decorate with candies, and serve!